Lake Louise and Banff are known Canadian ski destinations for travelers from across the globe. Explore Banff Sunshine and Mt. Norquay in the heart of Banff or check out Castle Mountain for an escape from the crowds. 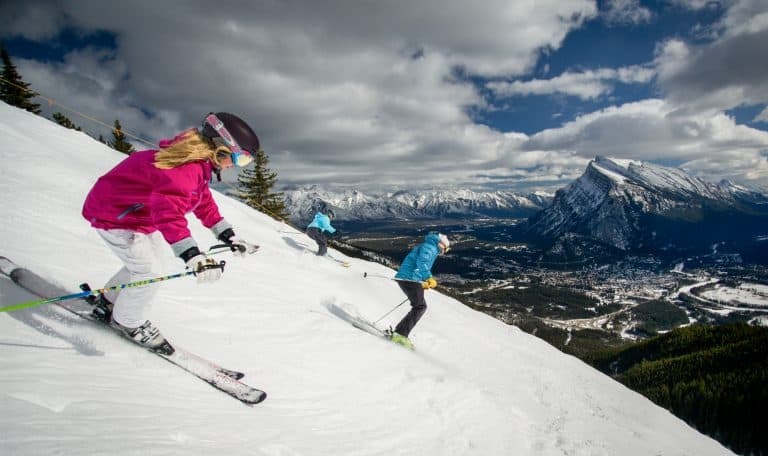 With hills stretching from Calgary to Jasper, there are plenty of options for skiing in Banff. Located less than 30-minutes from the Calgary International Airport, Canada Olympic Park is known for being home to the 1988 Olympics. The hill is used primarily as a beginner ground for young skiers as well as a training ground for elite athletes. Experience a beginner area, a progression park, a terrain park, as well as 548 feet long super pipe. For Beginners: Winsport at Calgary Olympic Park is a great place to head before skiing in Banff. There are numerous beginners carpets and plenty of space for kids to learn to turn and stop. There are three learning carpets that help kids get up the hill quickly without having to navigate a chair lift. Lessons are available for all ages and abilities starting at age three. For Seasoned-Skiers: Winsport offers three chairlifts leading to blue, green, black diamond and double-black diamond runs. For freestyle skiers and snowboarders, there is a 12 foot half pipe and 22 foot super pipe. The terrain park contains rails, jumps and more. Winsport offers the best tube park of all the hills in the area. 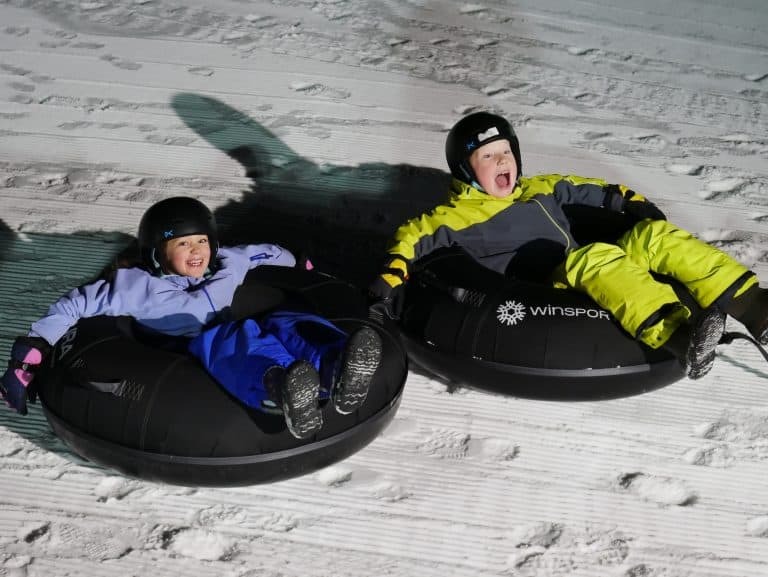 With 10 separate sliding hills and a dedicated carpet to take kids to the top of the sliding hill, Winsport definitely does tubing right. Lodging: Located just minutes from downtown Calgary, accommodation options abound. Find deals on family-friendly hotels in Calgary and explore our favorite things to do in Calgary with kids. 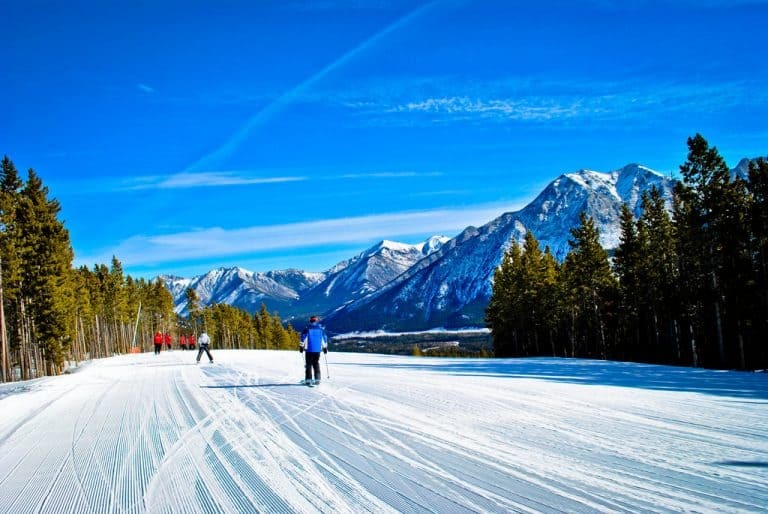 Only an hour from Calgary, Nakiska provides your first opportunity to ski the Canadian Rockies. Located in the heart of Kananaskis, a locals’ paradise, Nakiska is a great hill for families. With 3 high-speed quads chairs, 1 double chair, 2 magic carpets, and 79 marked trails, you won’t run out of things to do at Nakiska. For Beginners: Mid-mountain there is a dedicated area of kids runs as well as Kids World located directly at the base of the Mountain. 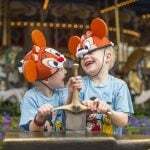 Kids World features magic carpets and several fun obstacles. For Seasoned-Skiers: Nakiska offers a variety of runs for skiers of all levels. Easy Street is a green run that stretches almost a mile from top to bottom of the hill. Monster Glades offers numerous blue and black diamond runs for experienced skiers. The longest run at the hill stretches over 2 miles. Lodging: Minutes from the base of Nakiska you will find Kananaskis Village home to two hotels, various restaurants, and the Knordic Spa, a Norwegian spa. Families love the Pomeroy Kananaskis Mountain Lodge (formerly the Delta Hotel by Marriott Kananaskis). Large family-sized suites include a loft area for sleeping and can fit families with up to 6 people. There is an indoor pool with water slides and a large indoor/outdoor hot tub. A free shuttle provides access to Naskiska, just a few minutes away. Other lodgings can be found in Canmore, Alberta. Located only 4 miles from the town of Banff, Mt. Norquay’s location means early birds will easily make first tracks on the hill. With 60 runs spread over 190 acres, Mt. Norquay has plenty of space to explore. Ski trails can be accessed by 1 high-speed quad chairlift, 2 quad chairlifts, 1 double chairlift, and 1 surface chairlift. The lift capacity of the hill is 7,000 people per hour. For Beginners: The Norquay Ski School provides lessons for all levels for both adults and children. Child group lessons start at age 3. Kids can choose between ski lessons, snowboard lessons, and even terrain park lessons. For Seasoned-Skiers: Runs at Mt. Norquay are evenly divided with nearly the same amount of black diamond runs as green and blue runs. Lodging: Being the closest ski hill to Banff, there are plenty of options for lodging in both Banff and nearby Canmore. Enjoy dinner on Banff Avenue, shopping and more. Recommended stops include The Bear Street Tavern and Fairmont Banff Springs. Check out our guide on the Top Things For Families to do in Banff. Located less than 20 minutes from the town of Banff, Banff Sunshine offers 3 mountains with terrain for every level of skier and snowboarder. A gondola takes guests from the parking area to the base of the Mountain. Banff Sunshine offers a variety of ski passes from half day passes valid from noon on to free ski passes for kids under the age of 5. For Beginners: Banff Sunshine offers a variety of runs and lessons for beginners. Families can opt for lessons or a package that includes lessons, lift ticket and rentals. 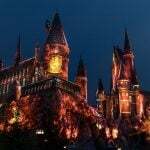 Lessons are offered for kids ages 3-12, teens, and adults. Goat’s Eye Mountain, Lookout Mountain, and Mount Standish all offer green and blue runs. For Seasoned-Skiers: Experienced skiers will love skiing Sunshine. Highlights include the Delirium Dive, a double-black diamond free-ride zone, and various black diamond runs. There are also 3 terrain parks at Sunshine. Lodging: The Sunshine Mountain Lodge offers on-mountain lodging for a true ski-in-ski-out experience. Guests take a Gondola to the lodge while check-in staff transports luggage up a side road. Other lodging options are available in Banff and Canmore. Looking for more to do than skiing in Banff? Read our guide to the Top 8 Things to do in Banff in Winter. If you are looking for an iconic Canadian Rockies ski experience, there is very little that compares to skiing at Lake Louise Ski Resort. Located a little over 30 minutes from Banff, Lake Louise has 4200 acres of skiable terrain with the longest run stretching over 5 miles. In total, Lake Louise offers 145 marked trails and back bowls. For Beginners: Lake Louise is designed so that each lift provides access to beginner, intermediate and expert runs. Beginners may want to book a lesson with the ski school. Families can choose from private or group lessons. Lake Louise offers lessons lasting only a few hours to full day camps. Child lessons begin at the age of 3. 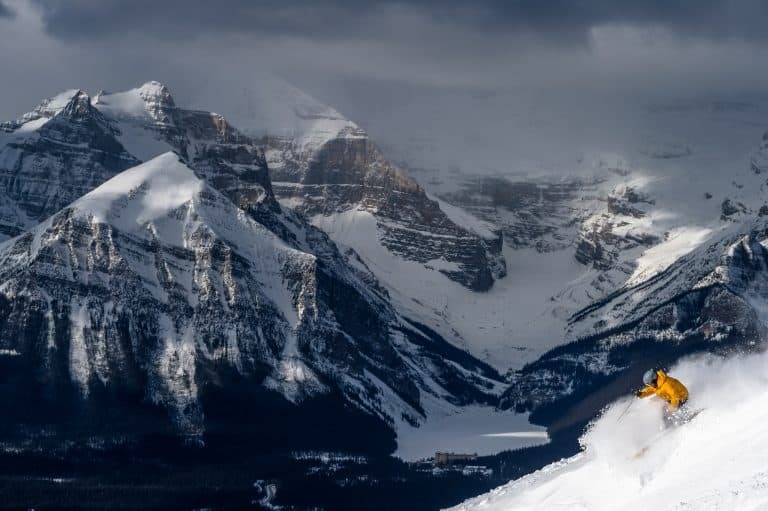 For Seasoned-Skiers: Lake Louise offers numerous runs that will challenge even the best skiers. Take the Summit Platter lift to Run #132, a high alpine experience that offers incredible views. More black diamond runs are offered off each lift with the Jackpot area being a favorite for skilled skiers. 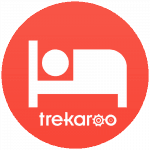 Lodging: Nearby lodging can be found in Lake Louise, Banff, and Canmore. Unique experiences nearby include the Skoki Lodge, which famously welcomed Prince William and Princess Kate. Other lodgings in Lake Louise includes the family-friendly Post Hotel and ultra-luxury Fairmont Chateau Lake Louise. Additional lodging options are available in Banff and Canmore. Tucked away from the rest of Banff, Castle Mountain Resort is a hidden gem. 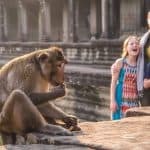 The resort is located two hours and 30 minutes southwest of Calgary and one hour and 30 minutes north of both the Carway and Roosville US Border crossing. With 2 mountains and 8 alpine bowls, Castle Mountain is home to over 94 trails, 6 lifts, and 2 terrain parks. Castle Mountain also hosts Alberta’s only cat skiing. For Beginners: Castle Mountain offers a true family experience. Mountain guides will tour the mountain showing you the best runs for each level of skiing. The Kids Club begins lessons for kids at the age of 18 months. Even the lifts at the highest elevation offer dedicated green runs. For Seasoned-Skiers: Experience skiers will love skiing Castle Mountain. With fewer crowds than some of the other hills, you’ll get plenty of skiing done in a weekend. For a challenge, experienced skiers can book the Powder Stagecoach for cat skiing. First, learn how to operate an avalanche safety kit and then head out with guides to the top of Haig Ridge and down the mountain. Lodging: The Castle Mountain Lodge offers both a hotel and hostel floor. Rooms in the hotel are equipped with a queen size bed and a bunk bed. There are also a number of ski-in-ski-out cabins available for rent. 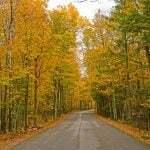 Other lodging options are available in the nearby towns Pincher Creek and Crowsnest Pass. Jasper, Alberta, a two-hour drive from Banff, was named North America’s Top Rated Ski Town for 2018. 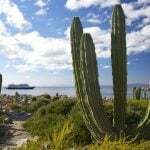 With plenty of diverse lodging, great restaurants, and a small town feel, it’s not hard to see why. 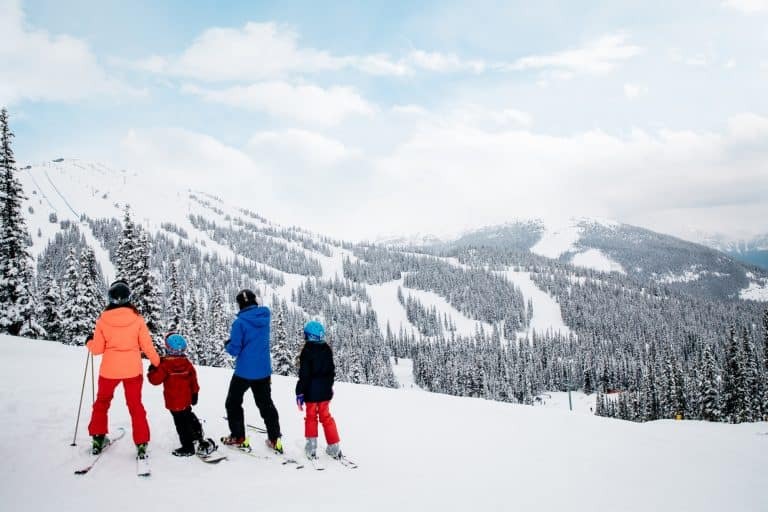 Marmot Basin has the highest base elevation of all Canadian ski hills. 7 lifts carry skiers to 91 runs. The runs are 30% novice, 30% intermediate, 20% advanced, 20% expert. The terrain parks contain both small and extra large features with jumps, rails, boxes, and jibs. For Beginners: Marmot Basin offers a number of novice and intermediate runs. The snow school offers “never before” packages which include rentals, a lift ticket, and lesson. Kids lessons begin at age 4. For Seasoned-Skiers: While the lower mountain offers 6 black diamond runs, expert skiers rule the upper mountain at Marmot Basin. The upper mountain has over 20 black diamond runs, both groomed and ungroomed, that will challenge even expert skiers. Lodging: Marmot Basin is only 12 miles from the town of Jasper. Families love the Fairmont Jasper Park Lodge which has a year-round outdoor pool and large hot tub. As you can see, there are plenty of options for families looking to go skiing in Banff. Banff Sunshine, Mt. Norquay, and Lake Louise, in the heart of Banff National Park, provide easy access to skiing from the town of Banff. 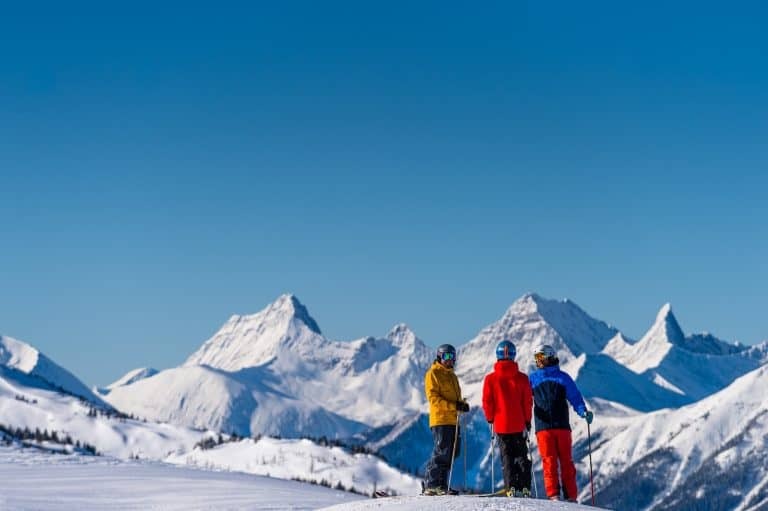 Castle Moutain and Marmot Basin are worth the drive to experience some of Alberta’s best skiing in less crowded settings. 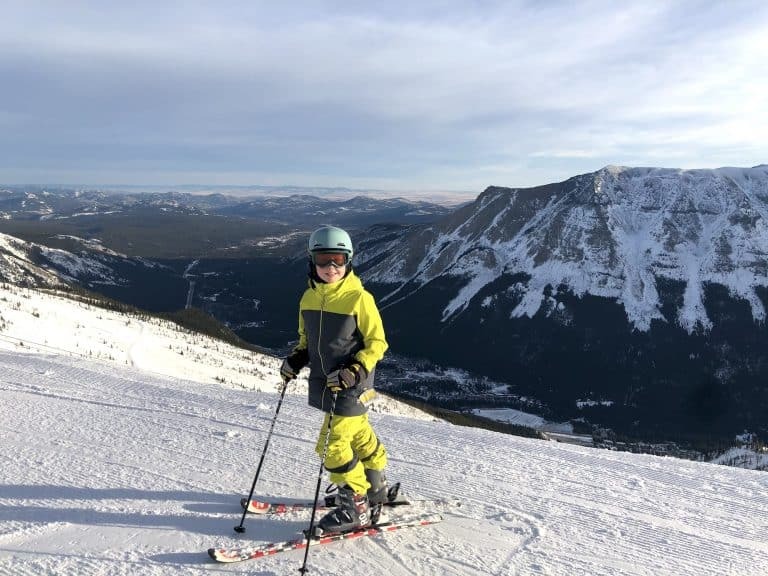 Nakiska and Winsport are closer to Calgary for families who may be short on time or want to combine skiing with a city-based vacation. Whether you choose one resort or sample many of them, you won’t regret skiing in the Canadian Rockies.